We are quite a ways through the book of Ezra, and it is interesting that we finally get to meet the guy. We might say that he is fashionably late to his own story. But I think that is kind of the point. Here is a little acknowledgment that the book of Ezra isn’t really about Ezra. The book of Ezra, like every book of the Bible, is about what God is doing in Christ to advance his kingdom. find is that the story is really about the Lord and how He is continuing to advance his kingdom. So, this morning, I want us to think about how the kingdom of God advances. And when we look into this passage, we find that the kingdom of God advances through God's Word, power, and grace. The first 10 verses introduce us to Ezra, and in these verses we learn that Ezra was a man who was utterly enthralled with the Word of God. The passage begins by telling us he was a priest, and it gives us some of the credentials of linage going all the way back to Aaron. The word there actually means “quick.” In other words, he had been so devoted to the study of God’s law that he could give a quick answer to anyone’s question. He had some real dexterity when it came to the issues of life and what the Bible said about it. And you’ll notice that verse 10 tells us that Ezra had set his heart to study the word of God and to do it and to teach it. So here is a guy who is infatuated with the Word of God. It is not that he has dabbled in it or has read the book once or twice. The word was the foundation of his life and his heart was absolutely enamored with it. 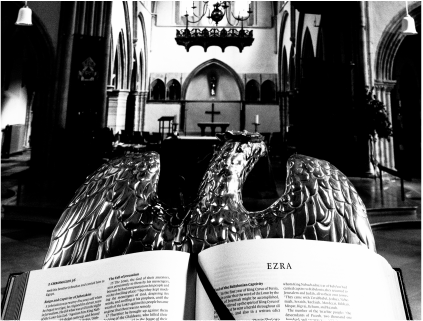 Ezra is different than most people who call themselves Christians today. Most Christians today will give a head nod to the Scripture. They will say that it’s a good book. But they really don’t have any particular interest in it outside of a few religious readings on Sunday morning. Ezra is vastly different. He is a guy who believes that the Law of God should be understood, obeyed, and propagated to others. It is the sum & substance of God’s will. Now, what I want you to see that it was this eagerness for the word and interest in propagating it that gave birth to the whole mission he undertook. Look at verse 6 again. It mentions his being a scribe, and then that same line mentions that the king gave him everything he requested. So the passage shows that there is some kind of relationship between the word he studied and the actions he took. He asked the king for provisions to make this journey because the word of God was moving in him and impelled him to seek the kingdom’s advancement. Verse 9 and 10 reiterate the same sort of thing, and perhaps make it much more clear. Verse 8 talks about the journey that he made and verse 9 tells us that it happened because the hand of God was on him. Then it further explains why God’s hand was upon him and why he made this journey. It was because he had set his heart to study the word, to obey it, and to teach it. What was it that instigated the work of the kingdom? It wasn’t Ezra’s great intellect or because he was some charismatic fellow. It was simply because he had become an incubator for the word of God. The word of God had stirred him to action. It was the catalyst that set this course of events into play. This is important to understand because it gives us a clue into our own lives and what God can do in each and every one of us. Think of it this way: You know that passage in the book of James that talks about Elijah being a man of prayer? It says that Elijah was a man just like us. He was just a normal person without any real exceptional characteristics. But it says that he prayed. And the sky was stopped up for three and a half years. His praying caused a drought. Now, we would want to say that Elijah was an extra ordinary person. We would want to set him on some sort of superhuman pedestal. But James tells us that isn’t so. He was just an ordinary guy. The thing that made him distinct is that he took the means of grace to heart. He prayed. When we look at Ezra, we could say the same thing. As a matter of fact, the Jews put Ezra on a pedestal. They see him as being a second Moses. There is some truth to that, but the point is that they consider him to be almost superhuman; a leader that is matched only by Moses. But what is it we find here. What are these first few verses of chapter 7 saying? They are telling us that Ezra was just another guy, just like anyone else. But what made him distinct is that he took the means of grace to heart. He studied the word of God. And the word of God stirred him; it stirred him to advance of the kingdom of God. You see, each of us can be an Ezra. The advancement of God’s kingdom is not found so much in extraordinary people who have obscene amount of charisma. The kingdom advances by means of the extraordinary power of God’s Word as it works in ordinary people. The kingdom advances, not just because of God’s word, but also because of God’s power. If there is one thing we’ve seen over and over in the book of Ezra it is the fact that God governs the all affairs of men. It is almost comical how each of the Persian kings becomes an instrument in advancing the kingdom somehow. We see the same thing in this chapter. Verses 11-26 relay for us the decree of Artaxerxes in which he charges Ezra to go back to Judea. But notice how his letter starts (verse 12). It says, “Artaxerxes, king of kings.” Of course, Artaxerxes was an emperor. He was the king and he had various vassal kings under him. So he was a king of kings. But what Scripture makes clear is that there is yet one more King who is over him. And Artaxerxes’ plans are merely the outworking of YHWH’s ultimate decree. So just like Cyrus’ decree back in chapter 1, we see here that this world superpower is but a pawn in the hands of God. But keep in mind who Artaxerxes is. Don’t lose sight of the timeline here. Artaxerxes is the son of Xerxes. And do you remember who Xerxes is? Xerxes is the king that Esther married. So it is very possible that Artaxerxes was influenced by Esther, or at the very least he was familiar with her story. All in all, the events of Esther’s life probably had further repercussions than just those surrounding the book that is named after her. She likely had a huge influence on Artaxerxes. Artaxerxes was probably favorable to the Jews because of Esther’s having been in his life. Esther really was put in place “for such a time as this.” Isn’t it interesting to think how the events of history were completely ordered by God to accomplish this? But this letter goes further. It is not just that Artaxerxes permits Ezra to travel back. It does much more than see to the fact that the entourage would make the journey, and even be well suited with provisions and treasures (the sum of which would have been about 3.5 tons of silver!). Artaxerxes goes even further to advance the kingdom by giving Ezra the green light to reform society according to biblical principles. Look at what it says in verse 14. Artaxerxes commissions Ezra to “make inquiries about Judah and Jerusalem according to the Law of your God.” So Ezra is commanded to make sure that the laws that are being enforced in Judah are Biblically based laws. Then down in verses 25-26, the very last section of the letter, we see that Ezra is told to appoint judges. And these judges are to be taught the Mosaic code. And Artaxerxes reinforces this edict by saying that anyone who does not obey the word of God is to be punished. I also like the fact that the clergy were given tax free status (24). You might wonder why that is. Well, part of it could be superstition. Get in the good graces of the clergy by given them a tax exempt status. But the other reason is that the Priests and Levites were not to be taxed in the OT code. This was his way of implementing the regulations of Scripture into the Judean society. All this is to say, the reforms in Israel began at the behest of a pagan king. You should be amazed when you read this. The kingdom of God is advancing, and it is advancing well beyond anything that Ezra could have accomplished on his own. It is merely another testimony to the sovereign power of God. We should recognize the place of God’s word and power, but we shouldn’t forget that God’s kingdom advances as a result of His grace too. The last portion of our chapter testifies to the fact that the advancement of God’s kingdom is sustained by grace. We see grace emphasized in two ways. The first way is in verse 27. In verse 27 Ezra acknowledges that all this has come about as a result of the Lord’s doing. Ezra says, “Praise be to the Lord, the God of our fathers.” Ezra zeros in on the fact that the Lord is a covenant keeping God. The things that were happening, were not so much a result of current events as they were the result of redemptive promises. It was mainly due to the promises that were first given to Abraham, Isaac, and Jacob. God had given promises to the Patriarchs and to David. They were affirmed through the prophet Jeremiah a hundred years before Ezra. Ezra recognizes that the benefits he is receiving are simply the Lord’s kindness in keeping the oath that he made long ago in His grace. Ezra recognizes the he’s no macho man. He’s just a sinner like you and me. But he recognized that God had done something great on his behalf and was about to do something great through him. Ezra had to confess that this was not what he deserved. But look at what that grace did: it gave Ezra the encouragement he needed to keep moving forward. Because of this steadfast love Ezra took courage. Is there not a hint here that this grace was what kept the project moving forward? The fact that Ezra took courage seems to indicate that he would not have kept pursuing these ends had not the Lord demonstrated his loving-kindness in this way. Everyone involved in kingdom work knows how discouraging it is. Paul was stoned, lashed, and cast away at sea. What gave him the zeal to keep going? It was the fact that God’s grace was sufficient. Whoever wishes to press on in worship and maintain the vigilance to fight against the evils of society, they have to be supercharged by the realization that they are but unworthy servants. And if God does anything, it is a demonstration of absurd kindness.